On August 12, Extreme will will release Saudades de Rock (pronounced "sow-dodge"), their first studio album in 13 years - which will coincide with their first world tour in over 12 years. The hard rock foursome - vocalist Gary Cherone, guitarist Nuno Bettencourt, bassist Pat Badger and new drummer Kevin Figueiredo - recorded their fifth studio offering at NRG Studios in Los Angeles with Bettencourt at the helm as producer and mixer. Saudades de Rock boasts 13 tracks, including the infectious roar of Star, the groove-laden, swagger of King Of The Ladies, a raw funk rock anthem called Learn To Love and the expressive ballad Ghost. "'Saudades' was always a beautiful word to me," Bettencourt explains about the Portuguese album moniker. "It expresses a longing; an underlying sadness for something or someone that's been missing in your life, and never quite sure if it will ever return. In this case, for us, it's rock 'n' roll. Saudades de Rock." 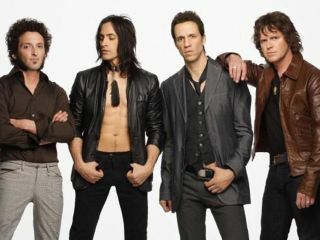 Gary Cherone adds, "I like how it expresses that longing we've been feeling to play for our fans and be together again." The Boston-bred Extreme, perhaps best known for their smash acoustic balled More Than Words, will embark on a world tour on July 29. In advance of the tour, the band will be a co-headliner on July 11 at the five-day classic metal blowout known as the Rocklahoma Festival in Pryor, Oklahoma.